Surprisingly good road manners, subtle good looks and a decent price point help the Cruze march on as a competitor, if not a class leader. The spiritual successor to the Cavalier and Cobalt had small shoes to fill in terms of its styling. But I think Chevrolet did a good job. 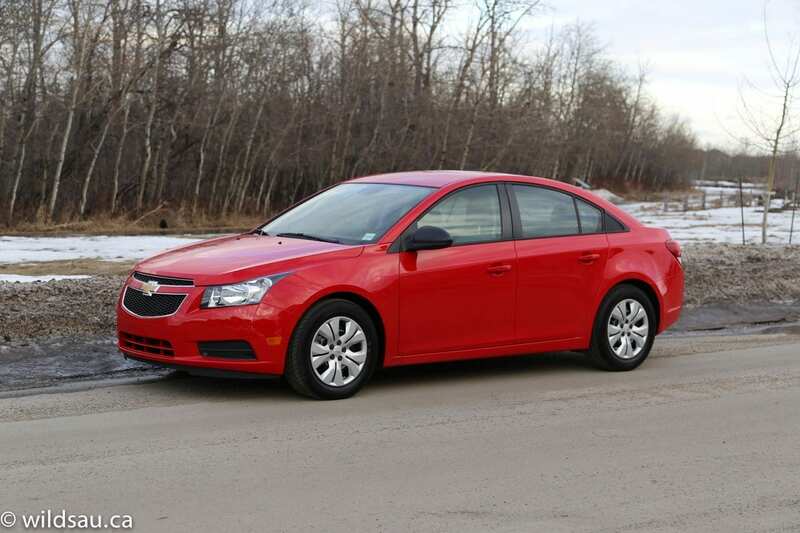 The Cruze’s design is grown up and doesn’t come across as entry-level. Though it’s unremarkable in most aspects, I think that this is the safest path to take in this class. So while the simple, strong lines have never got second looks, its well-rounded sophistication (for this segment) has aged well and while it is starting to get a tad dated, it remains a subtle, good looking car. My review car was nearly entry level, which means it had 16-inch rims with wheel covers. 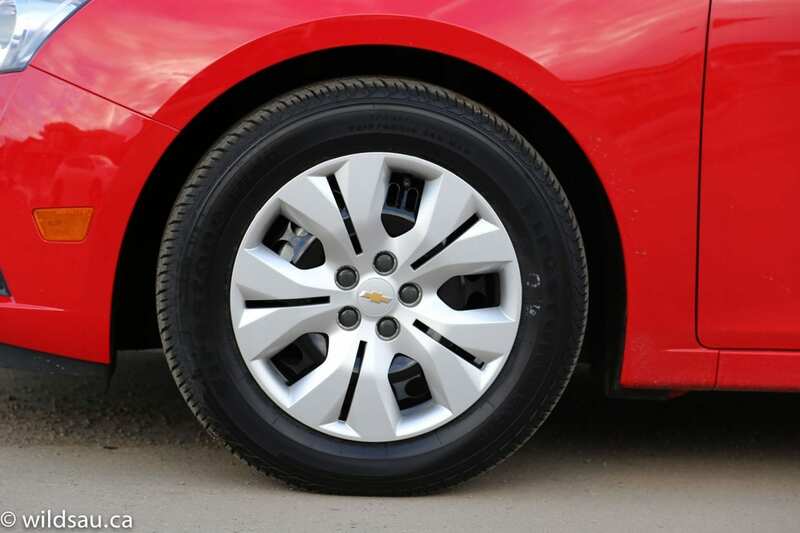 Though these aren’t horrible to look at, I obviously prefer some of the handsome rims that come on higher-trim Cruzes. Of note, my Cruze was also Red Hot. Probably not the colour I’d end up buying, but it sure got some attention. 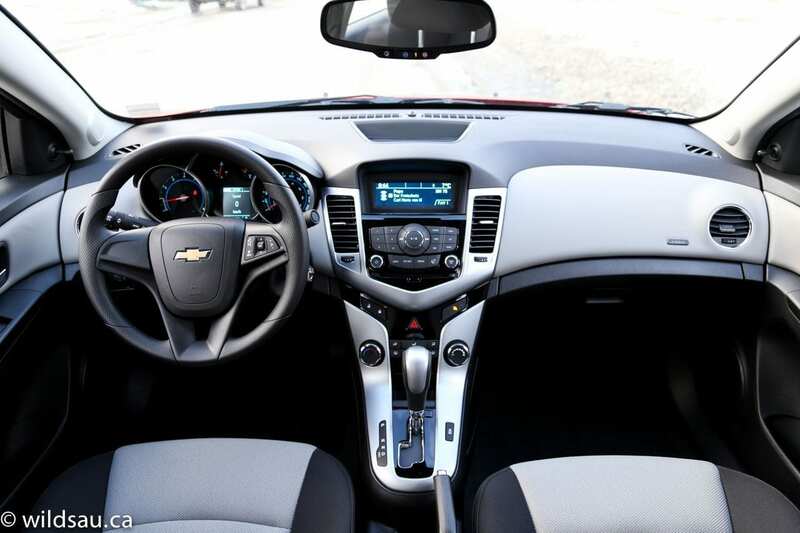 You’ll appreciate a generous amount of headroom as you sit down in the Cruze. The manually-adjustable fabric seats are supportive, but I had a tough time getting totally comfortable due to the pronounced upper cushion pushing into my shoulder blades. 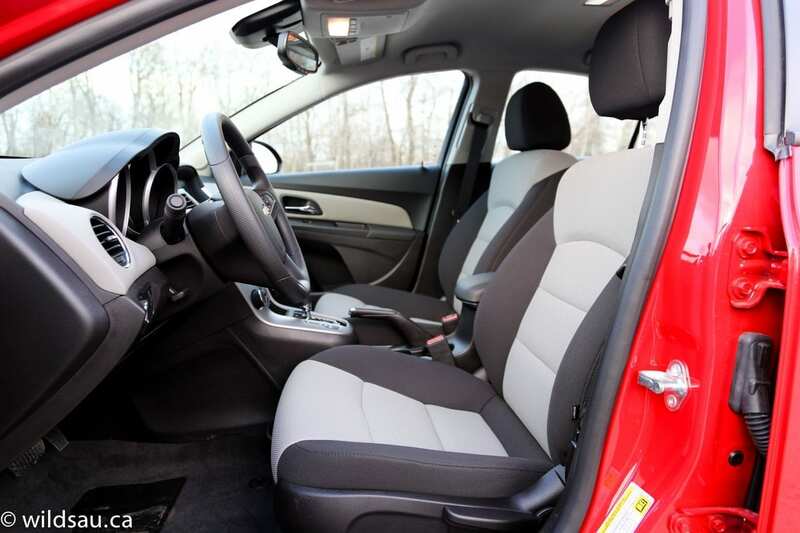 Seats are highly subjective things, so your mileage may vary. 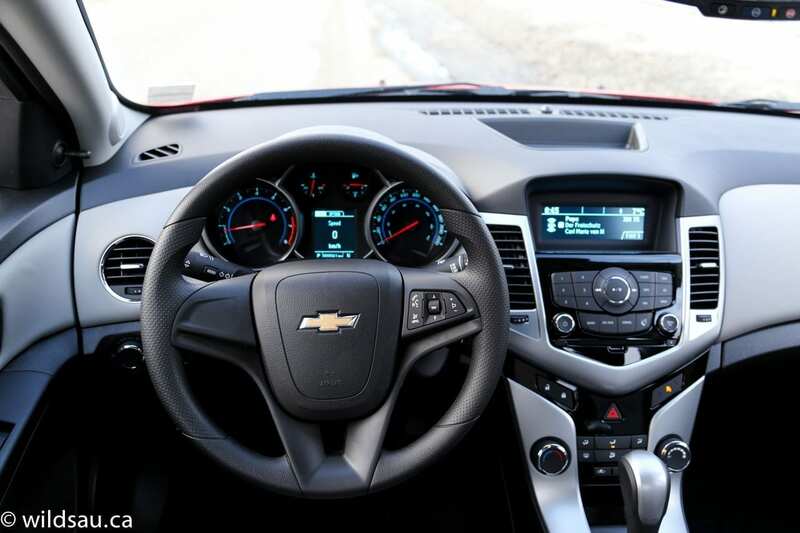 The Cruze’s dash styling is well done. The two-tone combined with what appears to be a high level of fit and finish comes across as upscale and looks good. The materials are a bit of a mixed bag. The dark areas are nicely textured but use a hard plastic, which comes across as a bit cheaper than what the competition is using these days, whereas the lighter accents are soft-touch padded plastic. The main gauges are large and clear, and they’re separated by a driver information screen. It is saddled with a crunchy, blocky font from the 1980s, but other than looking gross, it works well. The media and phone display screen in the centre of the dash gets the same unfortunate text and low-resolution graphics. Speaking of media, the sound system is passable and lets you grab your tunes from AM, FM, satellite, CD, auxiliary and USB sources. You won’t find Bluetooth streaming in this trim level. The steering wheel has controls for your phone as well as the sound system – including a much-appreciated mute button. The console houses the gear selector, a pair of cupholders, a 12V plug and a traditional parking brake lever and a small armrest. The car is started with a key – a bit of a rarity these days. The fob has remote locking and unlocking, as well as a trunk opener. 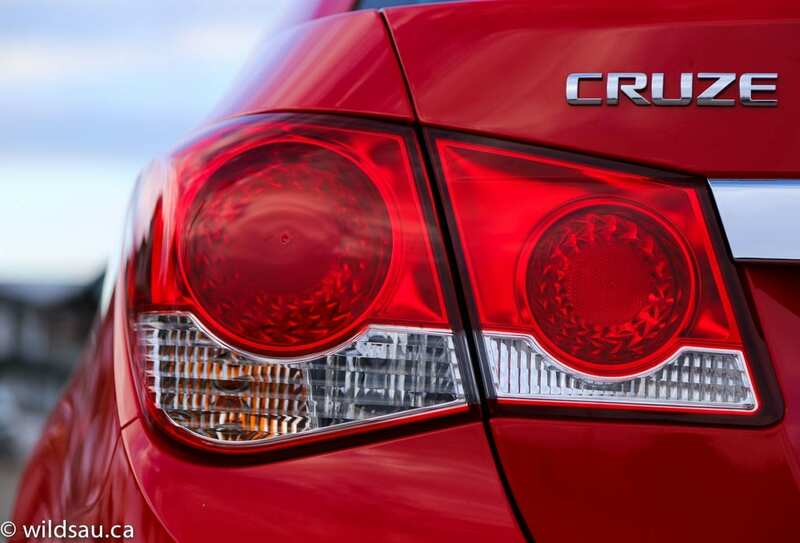 In this trim, the Cruze is a bit remarkable for what it doesn’t have. A couple of things that I’ve come to take for granted were missing here. 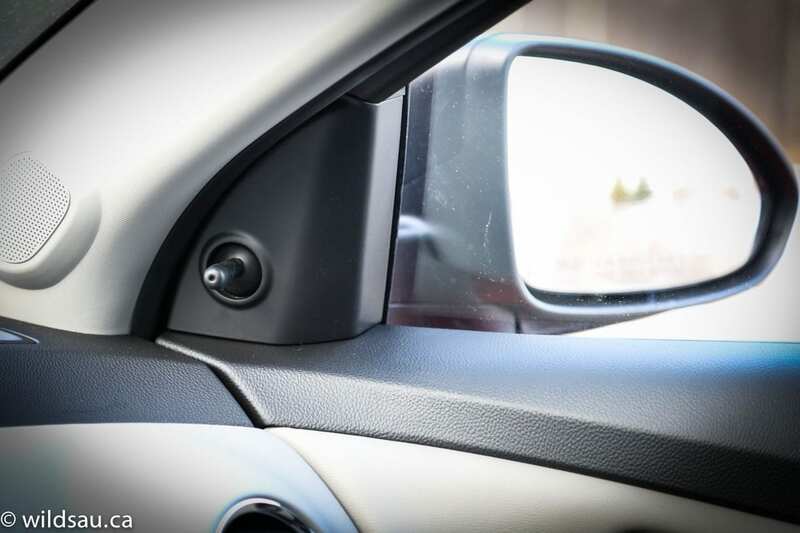 The mirrors are adjusted via a little joystick. Remember doing that? My kids had a blast with these things. Also, the lack of cruise control took me by surprise. That omission might not be a big issue to urbanites, but we’re on the highway a lot and use cruise control often. There is seating for three in the back. 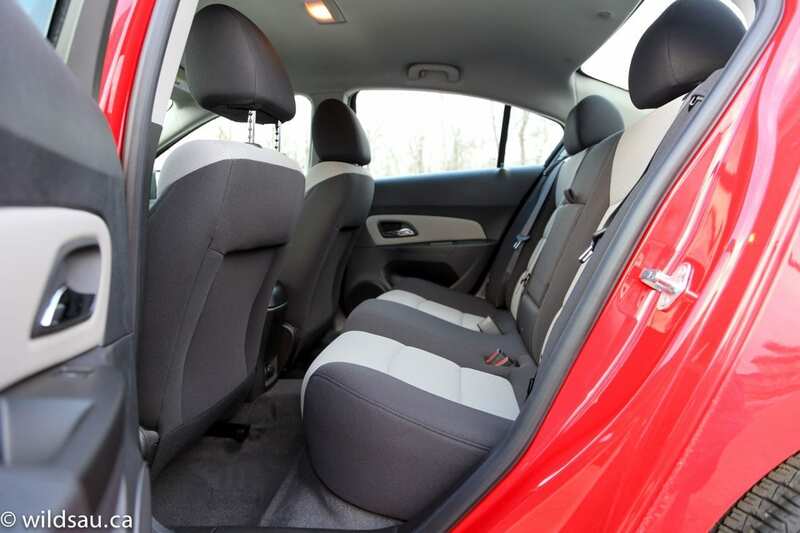 Getting into the rear felt a bit tight, but once you’re in, the two outboard seats are relatively comfortable with sufficient legroom – it is average for this segment. Those are the only two seats you’ll want to be sitting in anyway – the middle position is hard, narrow and raised, and it straddles a tunnel on the floor. Headroom was good for my height at 5’10”. In terms of convenience, it’s pretty sparse. There’s a 12V charging plug at the back of the centre console and the middle seatback folds down to become an armrest with a couple of cupholders in it. Our three kids felt the accommodations were pretty tight, width-wise. There are two sets of LATCH anchors for kids’ seats if you need them. The Cruze has a nice big glove compartment. Other than that you get door bins, which are basically giant bottle holders, a deep rubberized drop-in bin in the centre of the dash and a couple of strangely-shaped cubbyholes in the console. There is a small bin under the armrest, where you will also find the auxiliary and USB plugs. Where the Cruze sets itself apart is with its trunk – it is surprisingly large for a compact sedan at 425 litres. The arms aren’t shrouded, so your luggage could end up getting pinched underneath them, but it’s a highly useful cargo space. 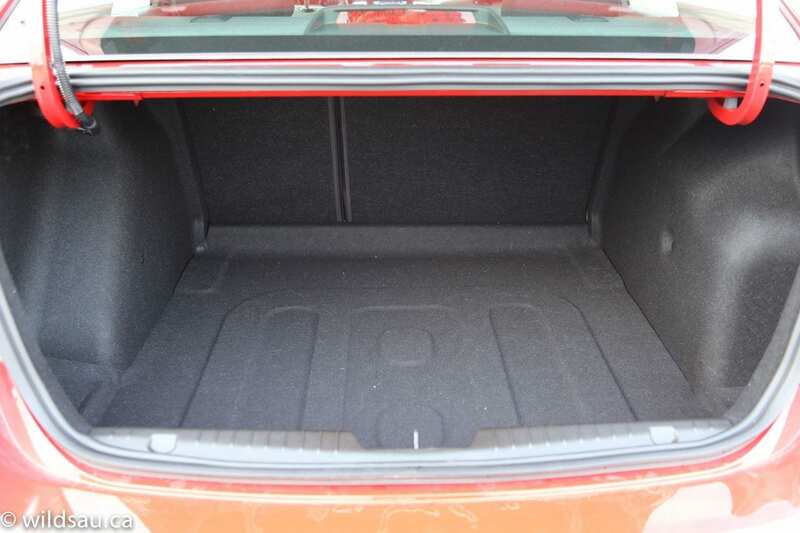 The rear seats fold down in a 60/40 split if you need to add to that. 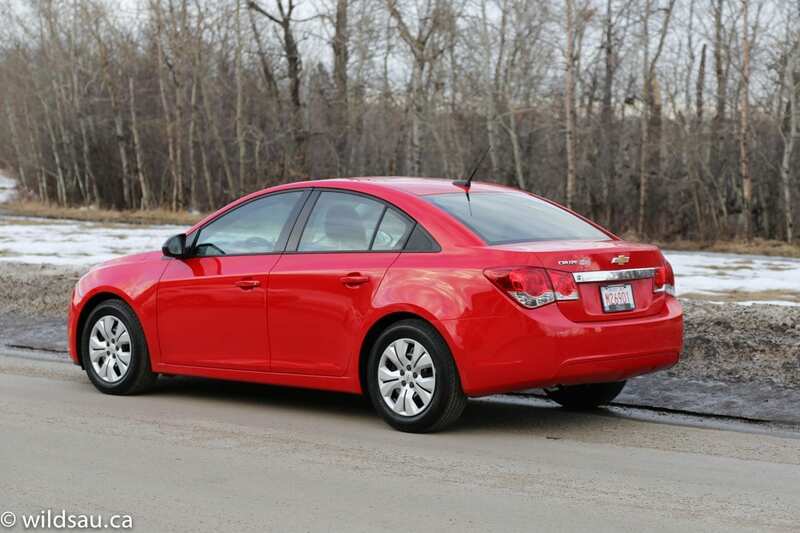 This Cruze came with the base engine – a relatively low-tech 1.8-litre 4-cylinder. 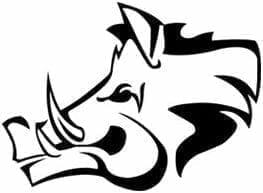 It is rated at 138 horsepower at 6300 RPM and 125 lb.ft of torque at 3800 RPM. Fuel economy is pegged at 9.2 L/100 km (26 US mpg) in the city and 5.6 L/100 km (42 US mpg) on the highway. I averaged 9.5 L/100 km (25 US mpg) driving the car mainly in the city, commuting and hauling kids to and fro. The tank holds 59 litres of fuel. 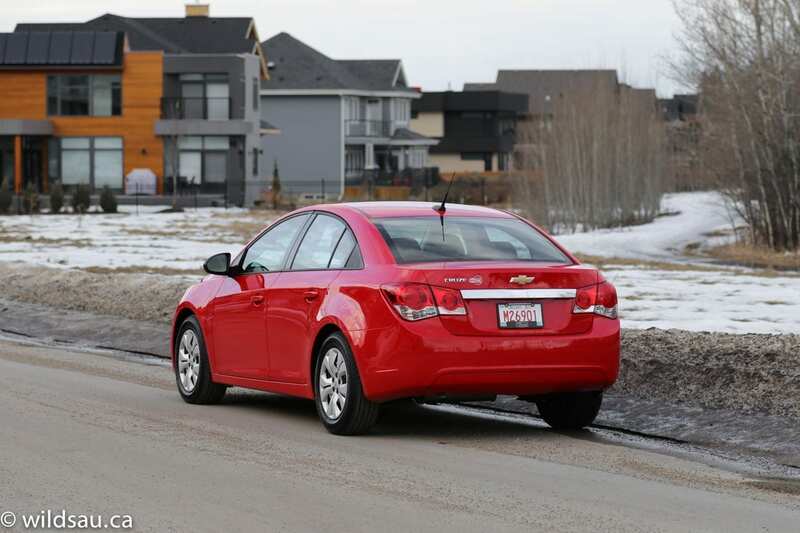 On paper, the Cruze doesn’t come across as an athlete, but it only weighs 3082 pounds and so its power is reasonable and acceptable in most driving situations. While the little mill makes some fairly uninspired sounds under the hood, it provides reasonable jam around town. Once you’re on the highway, passing power is lacking and you’ll need to leave yourself enough space and time to make your move. The 6-speed transmission was always smooth and well-behaved, if not particularly fun. The box is pretty sleepy and is obviously programmed to achieve the best fuel economy it can, which means it immediately hunts for higher gears. It grumpily kicks down when you step on it, and when it finally does, it takes its sweet time doing so. You can manually shift gears but it’s very slow. These characteristics aren’t unusual in this class, and I’m not really knocking the Cruze. 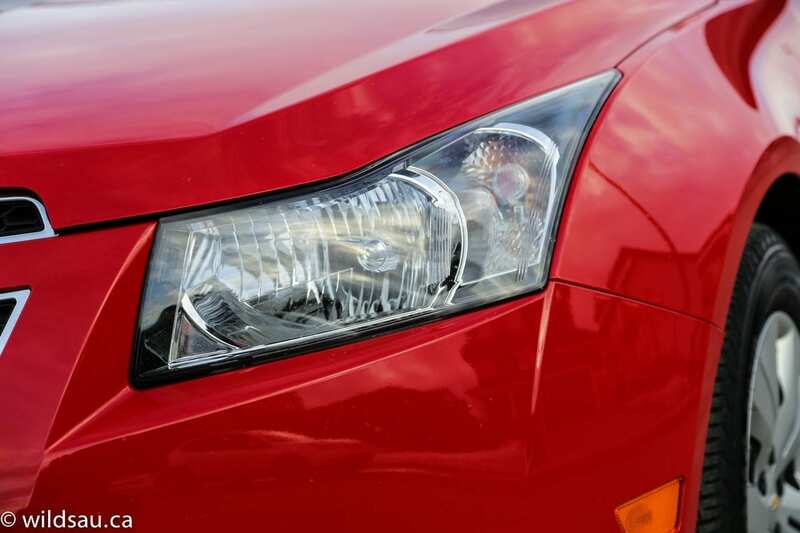 Where the car truly shines is in the great balance it finds between ride and handling. The ride is exemplary, soaking up big hits and feeling downright luxurious on better roads. 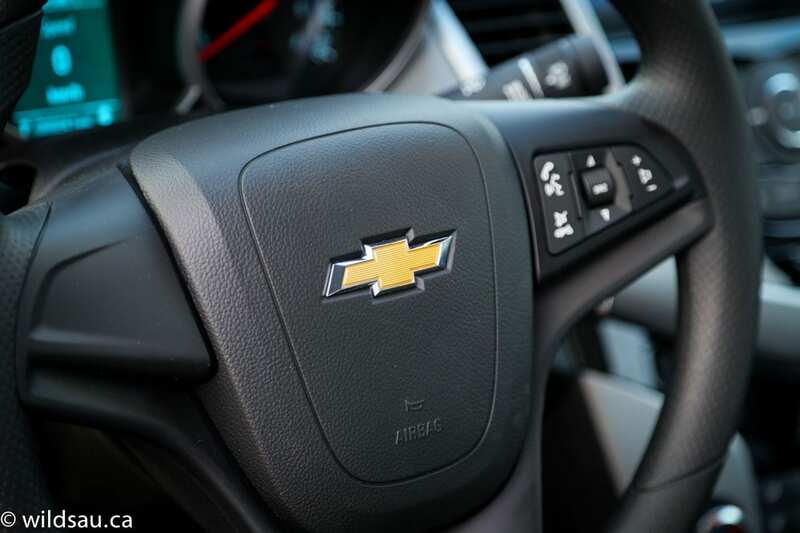 The ride didn’t just surprise me, it did the same with a few passengers that were ready to pounce on the Chevy based on prior hurts and transgressions they’d suffered at the hands of the Cruze’s predecessors. Every passenger indicated they were highly impressed with its road manners. The handling is secure and precise – while you can’t call it sporty, it borders on athletic for this class and I couldn’t help but be impressed by its competence. I did notice that there was some tire slap over harsher road irregularities like expansion joints. 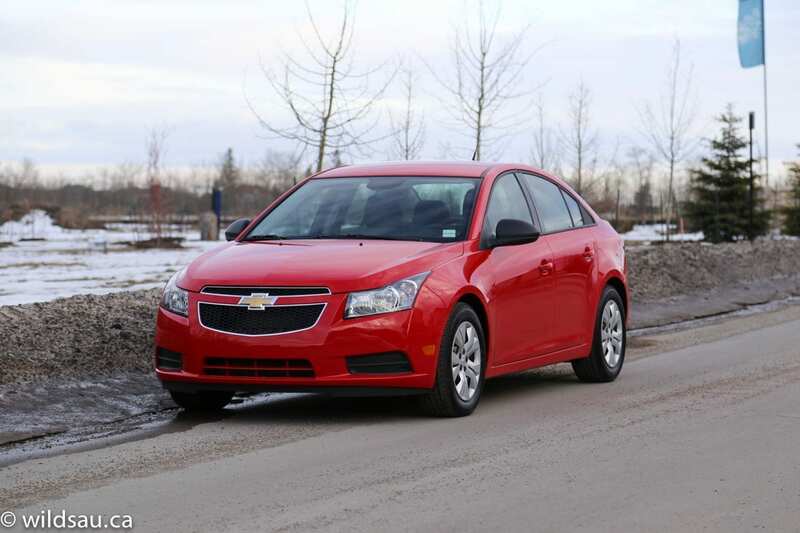 The Cruze felt very stable at higher speeds, and was quieter than expected in terms of road and wind noise. Visibility out of the car is good, and the brakes are powerful enough during normal driving. This is a highly competitive class, and the competition isn’t standing still either. A lot of people shop in this price bracket, and while I wouldn’t say the Cruze is the class leader, it’s refreshing to see GM offer a wholly competent vehicle in this segment. I give the Chevrolet Cruze a 6.5 out of 10. 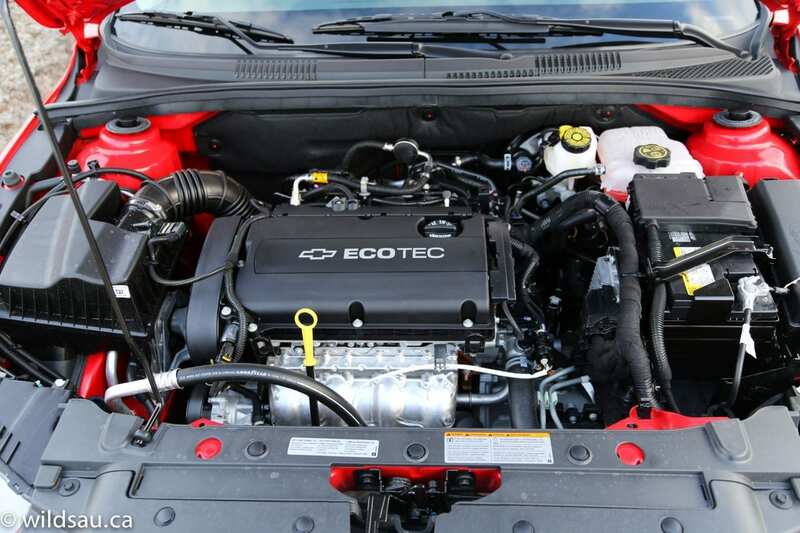 My personal preference would be to step it up a notch and dish out for the Eco trim, which gives you the torquier (and more efficient) 1.4-litre turbo 4-cylinder, some smart fuel-saving bits and a few extra goodies in the cabin. 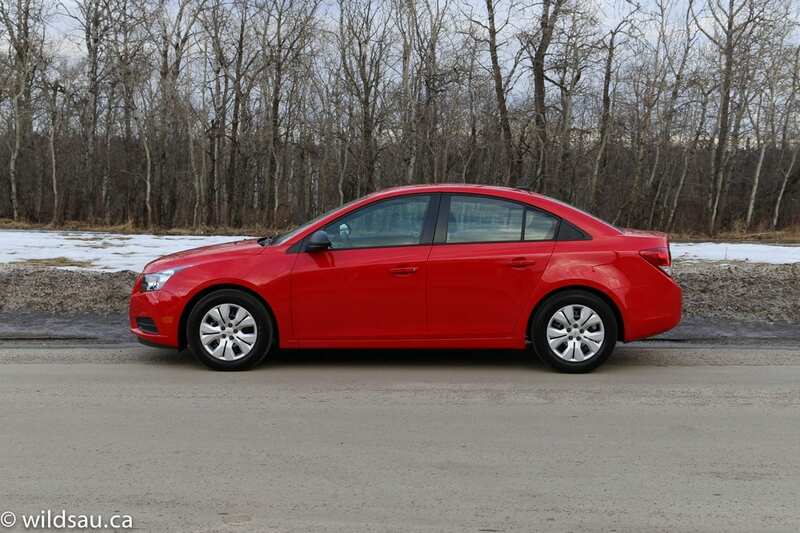 But for a price starting at a hair over 18 grand, the Cruze offers a lot for those looking to spend as little as possible and end up with a decent car. WAF (Wife Acceptance Factor) was high. She liked the straight-forward driving experience and commented on how easy it was to park. She also noticed the trunk was bigger than she expected, allowing her to spend even longer at the mall. She did agree with me that the Red Hot colour wasn’t the best fit for us though. Time marches on, and some new tech and designs have made their way into the compact sedan class. Does the competition do it better? Some things, yes. It’s hard to argue with the Mazda3’s driving dynamics or the upscale feeling you get in the Ford Focus, but as a package the Cruze remains a solid choice and its overall refinement continues to impress me.